Schuco sliding patio doors expertly supplied and fitted by Northwest Bifolds are a premium quality aluminium sliding door suitable for all types of applications. Where maximum light, slim lines and a high performance sliding door are required, the Schuco sliding door is ideal. Our market leading doors can be made larger and taller than many others, creating glass walls. You will regularly see Schuco doors featured in home renovations and Grand Designs style properties. They are packed with features, high end engineering making them one of the best types of sliding doors you can buy. Why choose a Schuco Sliding Door? Maximum light, slim sight lines and the creation of glass walls. The Schuco sliding door is designed not just for standard size doors but for installations where large glass sliding walls need to be created. With sliding panels of 3 metres wide and 3metres high possible, this means this is one of the best systems available for creating large sliding panels that are still light in use and effortless in operation. The best name in sliding doors. With the Schuco name being well known for offering the very best in sliding patio doors, these can be made to virtually any design meaning there is little restriction in how the doors can be used in your home and what features they can provide. A choice of frame profiles is available with all options giving an aesthetically pleasing contemporary appearance that is elegant, distinctive and seamless. 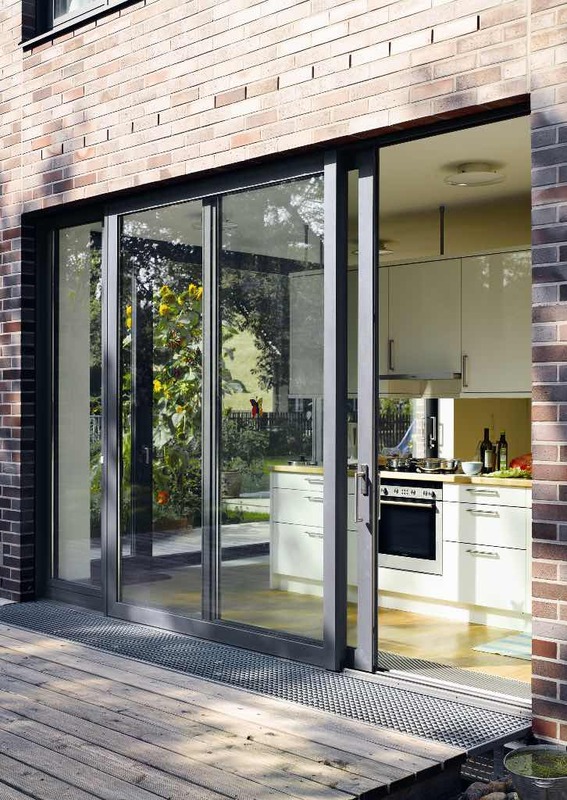 Schuco sliding doors offer some of the slimmest aluminium doors available today resulting in larger glass areas and less visible aluminium. Thermal efficiency is excellent giving U values of under 1.5 W/m2K depending upon the glass specificaiton chosen. With glass being the largest component in any sliding door this ensures your doors will save energy and help lower your heating bills. Security and weather performance are also a key feature with doors passing the latest security testing and providing exceptional protection from inclement weather. Advantages of Schuco Sliding Doors. A highly engineered sliding door installed in the finest homes and buildings, yet competitively priced. Ultra slim profiles of just 88mm up to 108mm making them one of the slimmest doors available. Large panels can be constructed creating sliding glass walls. Whatever your requirements for new sliding doors, all come with high quality polyester powder finish available in a choice of over 200 possible colours including different colours inside and out.